Just a quick update. 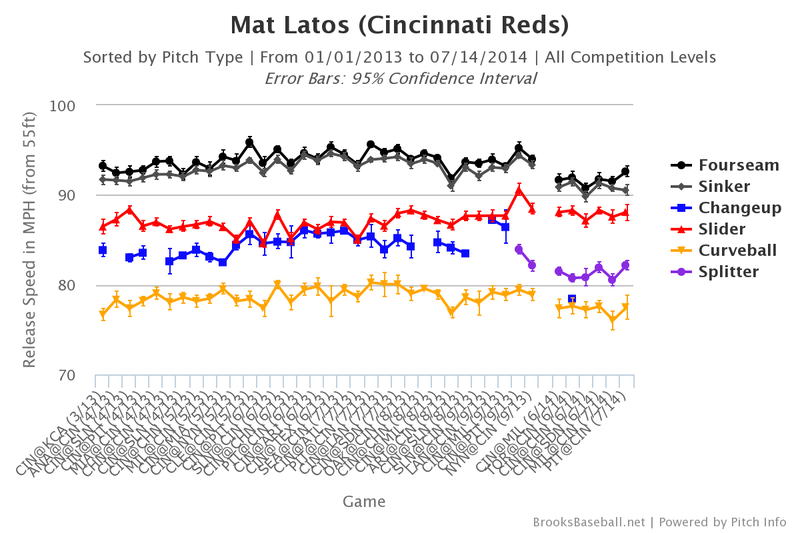 I wrote last week about Mat Latos's drop in velocity so far this season. While his most recent start was not particularly inspiring, I was pleased to see that his fastball velocity was up! He also showed better swinging strike rates (9.5% vs. 7.5% for the season...still below his career average), and better strikeout rates (5k's in 5 IP). Lots of fly balls, and obviously too many home runs...but if you wear the Rose-colored classes, it's a step in the right direction! Reds do nothing at trade deadline. That Roadtrip: Setback, or Correction? Should we worry about Mat Latos?